This is one really attractive, extremely well designed IP camera that you’ll be proud to install almost anywhere in your home or place of business. It works via a wired Ethernet connection, or via a wireless 802.11G (54Mbps). connection. We previously reviewed the TP-LINK AV Mini Powerline Adapter Starter Kit and had the opportunity to test the camera with that product. It worked flawlessly. An optional AV Powerline Adapter could provide you with many more options of where and how to connect the unit should you run into problems. However, you really shouldn’t have a problem with placement unless you have very picky construction. Should this happen you can really extend your network with this great product. This IP camera will do you well practically anywhere where you need to see what’s going on day or night, remote or local. It includes infra red technology to provide black/white night vision with almost no ambient light. The unit comes complete with brackets that allow you to attach in almost any position or location since the TP-Link can rotate in a 354 degree horizontal field and Tilt mode of 125 degrees. IP Camera Set up requires a little knowledge about networking. If you want to be able to remotely view with your camera you need a static IP address. Many cable broadband providers today keep your IP static (an IP address that stays the same) for long periods of time -- but that could change due to any changes in services. For remote viewing the camera needs to know your specific address so a permanent IP address is the key. Tip! However you could use the free Logmein remote control software and set your configuration up as an internal network!, or you could use a free dynamic IP service.. Or, for professional installations a paid Static IP Service might be the ticket. The TPLINK documentation which comes on CD is extremely well written as documentation goes. If you are familiar with networking you may not feel the need to consult the docs but trust me it's probably worth going over the docs to save you time later. I assumed I knew it all, but referring to the CD helped out considerably particularly using their included Surveillance Software and Intelligent Installer. These two included software applications give you remote control over advanced patrolling functions and remote viewing options. Very much like a router, you can access the TL-SC4171G’s internal software which also includes setup options (Advanced and Basic) as well as monitoring capabilities and patrol zone settings if you’re on your internal private network. In addition, if you use a free PC remote control program like Logmein, you have complete remote control over both the computer and access to the camera’s setup software (Intelligent IP Installer) and Surveillance Software features. 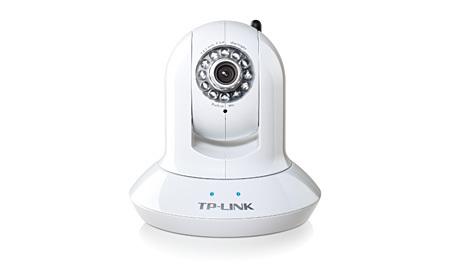 The Intelligent IP installer scans your network, finds the IP camera and then takes you through the setup sequence. It's very useful software. Since the camera comes with remote monitoring streaming video capacity you can view from an iPhone, iPad or capable mobile device. The camera can be purchased through Amazon and many online resellers. TP-LINK is becoming a more well known product and is increasing its retail footprint. Pro: Extremely high quality, performance hardware and low prices. Well written software. Highly Recommended. High value reasonable cost. Con: The bonus freeware included could have better descriptions and ideas for use. But really who cares. The TL-SC4171G is equipped with an industrial level IR-Cut filter Removable (ICR) component with high performance and stability. The filter completely removes infrared light that is used for night-time surveillance, allowing the camera to produce the most vibrant video without color distortion during the day. Meanwhile, in low-light, even completely dark environments, 12 IR (Infrared) LEDs turn on automatically to reveal clear monochrome video of the surrounding area. This unique function is unavailable on other traditional day/night cameras that offer moderately less video clarity. The TL-SC4171G can offers extra wide, whole-room surveillance coverage with 354 degree horizontal pan (left & right) and 125 degree vertical tilt (up & down). Moreover, 4 patrol tours that consist of 8 preset positions each make the camera automatically move along a desirable route to allow users to easily capture a number of specific points around a room to ensure that the most sensitive areas are covered, using the camera’s easy-to-use user interface. With the TL-SC4171G's built-in microphone or one purchased separately, users can hear what's happening within range of their cameras remotely. What's more, by connecting an external speaker to the TL-SC4171G, users may also speak to someone near the camera or give a public address depending on the speaker's strength. This brings users more convenience allowing for better communication when monitoring their cameras from a remote location. The TL-SC4171G's bundled surveillance software assists users with managing multiple cameras at the same time. With it, video from 16 cameras can be displayed on one screen. Users can archive streamed video and audio straight to their hard drives, playback video, and monitor up to 16 cameras on a single screen.